On September 11th, 2001 the greatest destruction and loss of life associated with the terrorist attacks took place in New York City. After almost nine years and numerous government investigations, many public misconceptions persist about the events of that tragic day, especially regarding the unprecedented destruction of the World Trade Center in Lower Manhattan. The presentation will provide a factual rebuttal of these and other myths regarding the destruction of the World Trade Center. 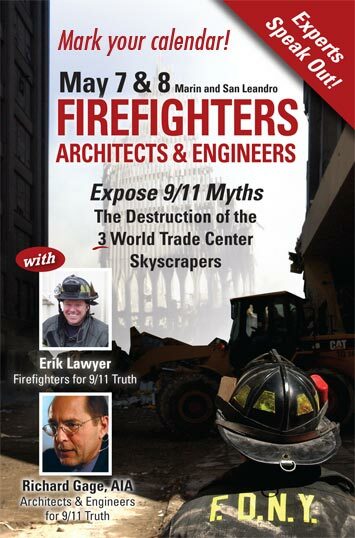 Erik Lawyer is a 14-year veteran of the Seattle Fire Department and the founder of Firefighters for 9/11 Truth, an organization with over 100 firefighters calling for a new investigation into the destruction of the WTC buildings. Richard Gage, AIA, has practiced architecture for over 20 years and is the founder of Architects & Engineers for 9/11 Truth, an organization with over 1000 architects and engineers calling for a new 9/11 WTC investigation.